It's estimated that 50 soccer fields of forests are lost every minute, according to the World Resources Institute (WRI). But where? A new website launched this week could answer that question. A partnership between WRI and about 40 other organizations has created Global Forest Watch (GFW): A free online forest monitoring system that can detect changes in tree cover in near-real-time. 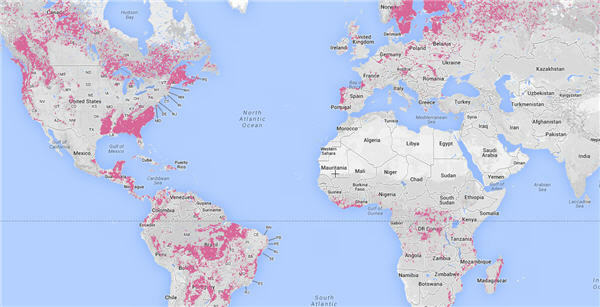 Using satellites, Google Maps, Google Earth and a variety of other resources, GFW "guarantees timely and reliable information about forests for anyone with access to an internet connection," Nigel Sizer wrote in a blog post for WRI. The implications are significant. Sizer notes that we currently know "remarkably little" about deforestation levels and that this data could help companies, citizens, and governments take quick action. "[T]op government officials lack the current data necessary to make well-informed decisions about land use planning and protected areas—let alone quickly detect illegal deforestation and enforce the law," Sizer wrote. Data on deforestation could be particularly useful in places where illegal mining is rampant. The effects of illegal gold mining in Peru's Amazon rainforest have been widely documented. Journalist Guido Lombardi said the damages made it look as if someone had "put a piece of the desert in the middle of the Amazon." The GFW map also shows gains in tree cover revealing, a significant imbalance between forest losses and gains in Peru and Brazil where illegal mining is extremely prevalent. Overall, the data shows that between 2000 and 2012, the earth has lost far more trees than it has gained.